and to the future of our industry through technology. Veneer Technologies Incorporated is a customer-driven, high technology veneer and other wood products supplier with an aspiration to lead the industry not only in the production of the highest quality materials through efficiencies achieved with productivity and superior production but also with an unselfish, action-not-talk commitment to the overall future of the resource, the industry, the craftsman, and companies who create function and art with wood veneer. Wood veneer is unmatched in its beauty and is an efficient use of wood resources sustainable with appropriate conservation and regulatory measures. Veneer Technologies actively supports environmental responsibility and sustainability of the resource with actions, not words, including financial support of the Hardwood Forestry Fund (HFF), the Forestry Stewardship Council (FSC) and other efforts in resource conservation. 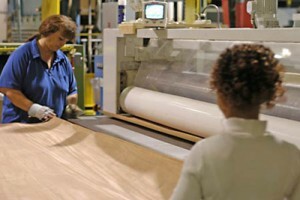 In 2005, in keeping with the company’s commitment to the health of the industry and to the companies and individuals who are its future, Veneer Technologies established the Veneer Tech Craftsman’s Challenge™. The Challenge is a design competition that recognizes the very finest in wood veneer craftsmanship with cash awards in several categories including student design, and recognizes the entire supply chain including distributors and their sales representatives. The Challenge offers a free, web-based entry system. 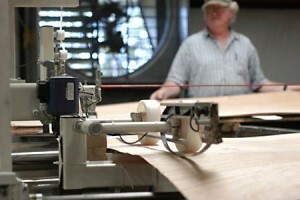 What has brought the Challenge great success and prestige is that it doesn’t matter how much or how little veneer and other wood products are used in any given project, or where the veneer material is purchased–even if the raw material is sourced from a supplier other than Veneer Tech. The Veneer Tech Craftsman’s Challenge is co-sponsored by Cabinetmaker+FDM. With nearly 200,000 square feet under roof, the company is one of the largest face veneer plants in North America. The company was established in 1993 and is located in Newport, NC, USA, with sister companies in the Moehring Group around the world. Veneer Technologies serves customers in the United States, Canada and beyond and specializes in natural face veneer, sheet veneers of every description, reconstituted veneer, edgebanding (melamine and natural wood), exotic hardwood lumber, and other specialty wood products. Company President Christian Weygoldt leads the Veneer Tech team.